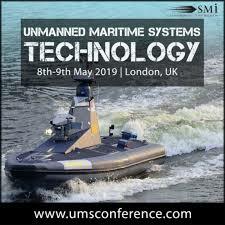 SMi is delighted to announce the return of Unmanned Maritime Systems Technology(UMST) conference taking place in London on 8th and 9th May 2019. SMi has recognised that there is a continuing need to consider how unmanned platforms will be integrated into the fleets of the future. With a new generation of unmanned & autonomous systems, navies are optimising their strategic position by utilising these platforms for ISR (Intelligence, Surveillance and Reconnaissance), mine countermeasures, hydrography, anti-submarine warfare, and to deliver lethal capabilities. UMST 2019 will build on the momentum generated from last year’s conference and the Royal Navy’s exercise Unmanned Warrior. As technology and innovation continue to push the boundaries of operational capabilities in Naval Warfare, UMST will be a crucial forum for the discussion of current and future projects and programmes delivering unmanned and autonomous technology for modern navies. New for 2019: Biomimetic Autonomous Systems, Verification and Validation of Unmanned Systems, Rotary and Fixed Wing Aerial Platforms for ISR, Autonomous Underwater Sensing, and much more! The future of unmanned capabilities.